Hi, I am currently the first-year Ph.D. student in Computer Science at Boston University, supervised by Prof. Kate Saenko. Previously, I received my M.S. in ECE from University of Michigan, Ann Arbor and received B.ENG. in Communication Engineering from Beijing University of Posts and Telecommunications. I am currently interested in the deep learning and computer vision. My recent research is focused on the deep generative models and disentangled representations. 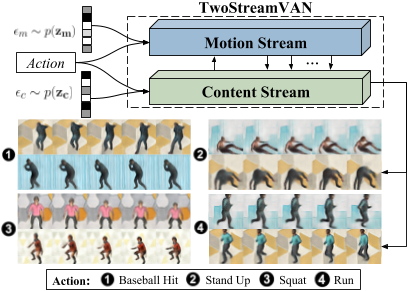 We propose TwoStreamVAN to output a realistic video given an input action label by progressively generating and fusing motion and content features at multiple scales using adaptive motion kernels. In addition, to better evaluate video generation models, we design a new synthetic human action dataset to bridge the difficulty gap between overcomplicated human action datasets and simple toy datasets. We propose the first deep learning solution to video frame inpainting. We devise a pipeline composed of two modules: a bidirectional video prediction module and a temporally-aware frame interpolation module. Our experiments demonstrate that our approach produces more accurate and qualitatively satisfying results than a state-of-the-art video prediction method and many strong frame inpainting baselines.